At the drawing desk in my bedroom studio in Los Feliz, I was busy making semi-circles and slash marks with my pen on a sketch of three bearded characters holding a surfboard when I heard the ping of an e-mail popping into my inbox. It was an invitation from the Chinese American Museum in downtown L.A. to participate in “L.A. 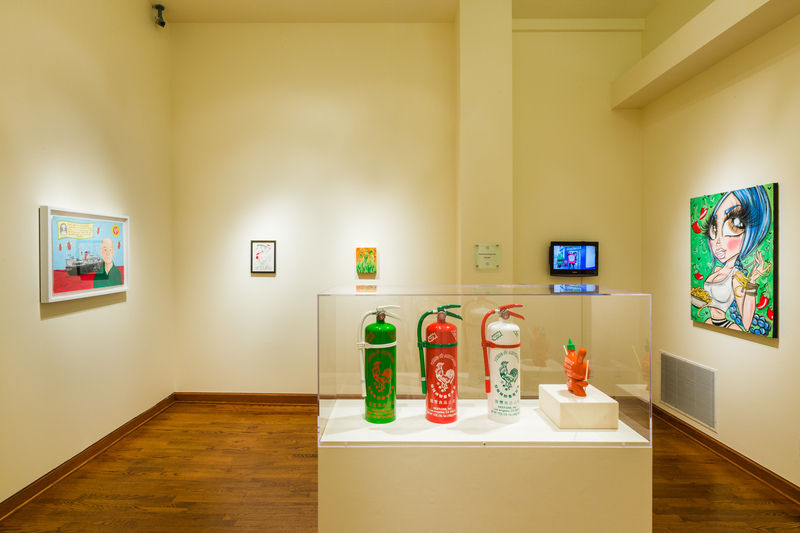 Heat,” an exhibition about my two favorite hot sauces: Tapatío and Sriracha. I was intrigued and nervous: How could I incorporate hot sauce and my love for that spicy, lip-tingling feeling into a drawing that wouldn’t be cheesy or forced? I typically work in pen and/or brush to make character-based illustrations (think portly men that are half-parrot and sport a pirate eye patch, bespectacled surfing bears, a bearded lady lifting dumbbells). And I was thinking about what I could do in my typical color scheme of black, white, and red (which got to be my thing because around 2007, when I dedicated myself to drawing, I had pens in mostly those colors). To see if I could even come up with a good idea for this exhibition, I started sketching. 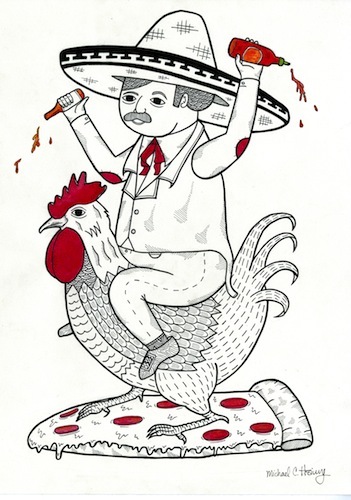 I decided to draw the sombrero-wearing man on the Tapatío label sitting on the iconic rooster on the Sriracha bottle. I added both sauces to the man’s hands, so he’d look as if he was dumping the sauces out on something. The something I hadn’t quite figured out—I just knew I wanted it to be fun—so I left it as it was, on my desk. I wanted to mull it over. My exposure to these sauces had nothing to do with my Chinese parents and much more to do with being a 15-year-old skateboarder who ate Mexican food with my friends any chance we got. I remember when my baggy-clothed buddies and I used to skateboard down Ventura Boulevard to the Taco Bell by Taft High School. We doused our bland seven-layer burritos with generic hot sauce. One day, one of our friends brought a bottle of Tapatío with him. The hot spice flavor made everything taste better. From there on out, it was always about the Tapatío. A bunch of us even equipped our run-down VW bugs, Dodge Darts, and Nissan Sentras with the sauce, which we kept in the glove compartments. I remember moving into my first apartment and buying a bottle of Tapatío for the fridge, which made me feel pretty grown up. It wasn’t until college that I really got to know my other favorite hot sauce, Sriracha. After a mediocre effort in high school, I wanted to move away from Southern California and try my luck somewhere else. San Francisco was too expensive of a city; Santa Cruz was too small; and well, San Jose, although I had never been there, was medium-sized and seemed just right. I lived in the dorms for a year, then moved into a three-bedroom Victorian with five skateboarders—one of them lived in a converted shed and another slept in a laundry room closet. Everyone in that house used Sriracha—some of us shared a bottle and others had their own individually marked bottles of sauce. Because there is a large population of Vietnamese people in San Jose, and after I started dating a Vietnamese-American girl, I found myself eating more Vietnamese food every day. I mixed streams of Sriracha into the broth of my pho and squirted it all over the pâté in my bánh mì sandwiches. My consumption of Sriracha overtook my Tapatío intake, actually. Even though my relationship with the girl ended, my relationship with that sauce evolved into a lifelong infatuation. Back in Los Angeles now and married (to my wife, Rachel), my hot sauce usage has gone down. It’s not that I overdid it—I’m very careful not to ruin my love for hot sauce. It’s that my wife has sensitive taste buds. When we first met, if even a drip of hot sauce got on her food, she’d be sweating and drinking tons of water. I originally worried her hot sauce aversion would be a problem, but she’s gotten a little more tolerant, and I still get to enjoy hot sauce by putting it on food I’ve cooked for myself—or food I don’t want her to eat! When I make myself breakfast in the morning (and she’s not awake), I’ll make some scrambled eggs with sausage, sprinkle them with cilantro and dill, and douse everything in Sriracha. Nothing wakes you up like Sriracha. It took me a few weeks to come back to my first man-on-a-rooster sketch and realize what he should be dumping Tapatío and Sriracha on: a giant pizza slice. I hadn’t eaten pizza in a while—I’m trying to eat healthier these days—but there was a phase when I wanted nothing but pepperoni pizza. And when the pizza was day-old and cold, Srirachi gave it a second life. When I drew the pizza in there, I hoped I wasn’t the only person who ate pizza like this. I was relieved when the museum folks told me they liked the piece a lot, and then flattered when they chose it as the poster and postcard. I really want my piece to make folks smile. I also hope it shows how the various cultures that exist in Los Angeles add layers onto the way we eat. For instance, I can’t just have plain scrambled eggs anymore—I have to experiment with new flavors, spices, herbs, and sauces. Pouring Tapatío and Sriracha on my American food is like adding to the iconic American pie—well, the pizza pie, anyway. And now, I’m hungry. *An earlier version incorrectly referred to a car as a Toyota Sentra. It is a Nissan Sentra. “L.A. Heat” is on view at the Chinese American Museum in Los Angeles until July 12, 2014. More information is available at http://camla.org/. Michael C. Hsiung spends his days drawing, making prints, stickers, and zines; collaborating with his sister, artist Pearl Hsiung, under the Fight To The Death moniker; and doing freelance work. He is currently working on his new exhibition "Who Cares Wins," which opens in June 2014 at the Vincent Price Art Museum. *Images courtesy of the Chinese American Museum. Photo by Brandon Shigeta.